Management of essential trial documentation is, indisputably, one of the most time consuming and costly activities associated with conducting a clinical trial. ICH E6 guidance on Good Clinical Practice (GCP) specifies an inventory of over 200 discrete documents that must be managed before, during and after the trial. Any or all of these documents must be available for audit by the sponsor and for inspection by the regulatory authorities, and considering the massive volumes of documentation involved in the process, the effective management and exchange of study documentation can have a significant impact on the cost and time to complete a clinical trial. Yet despite the costs in time, effort and money, the trial master file (TMF) is often still managed through a combination of paper and simple shared folders, scattered across many locations in various countries. Ennov eTMF is an electronic trial master file solution to collect and manage essential trial documents in a centralized repository and makes them available to clinical teams, via the internet, from any location at any time. The benefits of using Ennov eTMF include streamlined processes, increased transparency, simplified tracking and enhanced security. Ennov eTMF leverages the power of our comprehensive Enterprise Document Management software (Ennov Doc) and Business Process Management (Ennov Process) software, as they serve as the foundation of the solution. 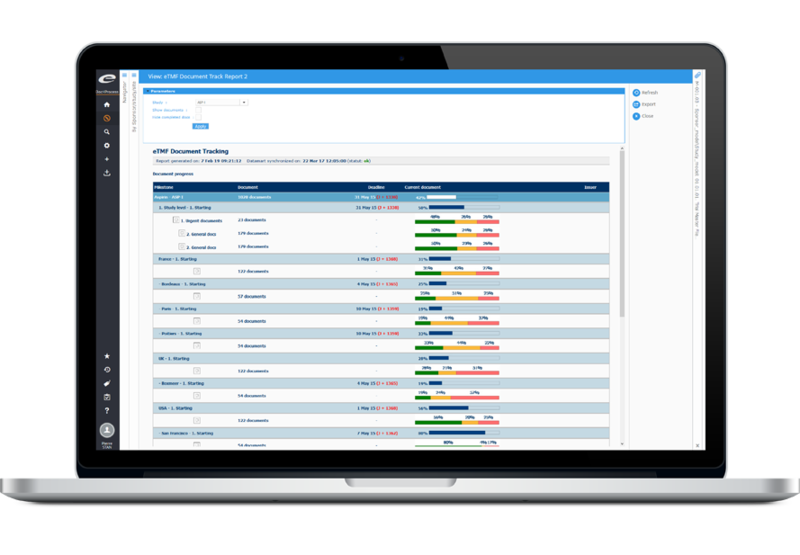 The robust metadata driven document model, highly configurable workflows, powerful searching and flexible views combined with our engaging and intuitive user interface provide all the functionality required to effectively and efficiently manage your clinical trial documentation. Ennov eTMF is a comprehensive solution for managing clinical trial documentation. The document inventory is pre-configured in alignment with the DIA TMF Reference Model and includes all required zones, sections and artifacts. Ennov eTMF’s metadata-based document model provides the flexibility to adapt this model to your company’s organizational needs. Our intuitive suite of design utilities allow administrators to configure and manage the system without needing IT skills. Ennov eTMF’s scalability and security enables you to safely manage large volumes of documents – making it the perfect solution for global deployments.